Posts about new technology or the tech tools we are using and like. Spock at his computer station. I’ve been amused to hear that Hover Boards are finally showing up, that people have been pushing forward to create them. The deadline they were aiming for was the date from Back to the Future 2 last year. Which made Hover Boards like a prophecy: that they would happen in that year. More than anything else in that movie, the Hover Board is what seems to have captured and held our collective imagination. Or maybe because it seems easier and more likely than flying cars or Jaws 19. Maybe because it’s a sellable commodity that you can hope to make a bunch of money off of – but no, I think more than that. It seems like a labor of love. Of trying to bring a bit of the “future” here to us now. Because this world we’re living in – as we pass dates from future visions, like Days of Future Past and Back to the Future – looks nothing like what science fiction envisioned. And what did science fiction envision? We were expecting flying cars. Hover Boards. Things that move us around faster. And space travel, moving us into the stars. What we got instead, as the commercial says (and which has stuck with me all these years) is the Internet. Or maybe, drones, which work as a networked extension of ourselves, rather than us moving ourselves. Rather than transmitting ourselves via improved transportation, we’re transmitting ideas. Meaning that we get to both bring the world – information-wise – to us, and we get to send our ideas back out. In such a way as science fiction somewhat failed to predict. That’s part of the reason why something like Neuromancer (a 1984 novel) is seen as such a classic: it was far closer to right than wrong when it comes to predictions of the future. Certainly better than so much other science fiction. I’m not saying the point of science fiction is to perfectly predict the future. Nor that it’s our job to try to build the future that has been predicted. Which makes the anecdote of the Hover Boards being created just in time for their “predicted” date just so interesting. It’s a little piece of trying to create not the future we’re building towards, but the future we dreamed up. And really, we’ve talked a lot about the dystopian possibilities of the future, in our Science Fiction Today posts. Doom and gloom honestly seem very likely. Should we plan for the future – raise the Geek Baby – with that in mind? And it all comes back to Dune. Rather than writing the story about the war with the machines, Frank Herbert wrote the story of the future long after that time. When humanity has learned to do without nearly so much technology – and have done so by enhancing humanity, through rigorous training, enhanced drugs, whatever means – just to not use computers and machines instead. If we were to raise the Geek Baby without reliance on technology, this seems like the reason and the way to do so. Raise her as a mentat almost, a human computer. All full of logic and deduction and data. Maybe start with Sherlock? Battlestar Galactica and the fear of networked computers? If we were having coffee, I’d say hello, and how are you doing? I’d probably talk about the upcoming Platypus Con, and all my plans to get things constructed, painted, and on the table to be playing some increasingly cool looking and competent Warmachine with our growing group. I might talk about shows or games or other things we’re up to, but honestly those all came up in recent posts as well. No, what I’d probably do if we were having coffee is gush about the Geek Baby. A big recent topic of consideration, concern, reading, and discussion has been Screen Time. For a long time, the official advice to parents has been Screen Time Is Bad, with the recommendation to be zero Screen Time before age 2. I’m sure you can imagine where our problems begin. If not, hello, welcome to Comparative Geeks, we’re kind of plugged in. 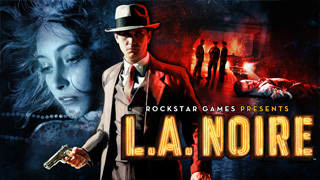 I can’t believe it’s already been over 4 years since L.A. Noire first came out. I remembered hearing a great deal about it at the time, and really wanted to play it, but unfortunately back then I didn’t have a PS3 of my own. I’d almost completely forgotten about it until we were in Game Stop the other day and it was on sale for $5. So I finally decided to pick it up and try it. I haven’t even gotten close to finishing it, I don’t think, but I really love it already. The story is based in post-WW2 Los Angeles, and the main character is a former decorated Marine and new cop. You start playing as a patrol officer, and immediately head off to a murder scene, which by going above and beyond to solve, you quickly begin to move up the ranks of the force to detective. From there you start investigating cases one at a time, including some homicides reminiscent of the Black Dahlia, and…that’s as far as I’ve gotten. And sorry, but I’m loving the story-line so much I don’t want to spoil it for myself.